Richard Florida is one of the more successful writers in economic development. He also is a very effective speaker; the Curmudgeon himself was in attendance at IEDC’s Phoenix Conference when Florida detailed his new book, The Rise of the Creative Class (Basic Books, 2002). The Rise of the Creative Class had a noticeable impact among economic developers and a number of communities attempted policies which simulated policy prescriptions compatible with The Rise of the Creative Class. Indeed, a sub-culture within the profession, certainly with the media has evolved. The Rise of the Creative Class also generated a counter-reaction which made Florida among the more controversial of economic development writers. In this critical vein, the Curmudgeon calls attention to Alec MacGillis, The Ruse of the Creative Class, the American Prospect, Dec 18, 2009. The Ruse delivered a rather crushing blow to Florida’s creative class concept, at least in terms of its applicability and success. But for our purposes in this month’s review, the reader is left to his or her own devices as far as the Creative Class is concerned. Instead, in this commentary we are going to take a focused gander at his latest best-selling book, The Great Reset, Harper 2010. 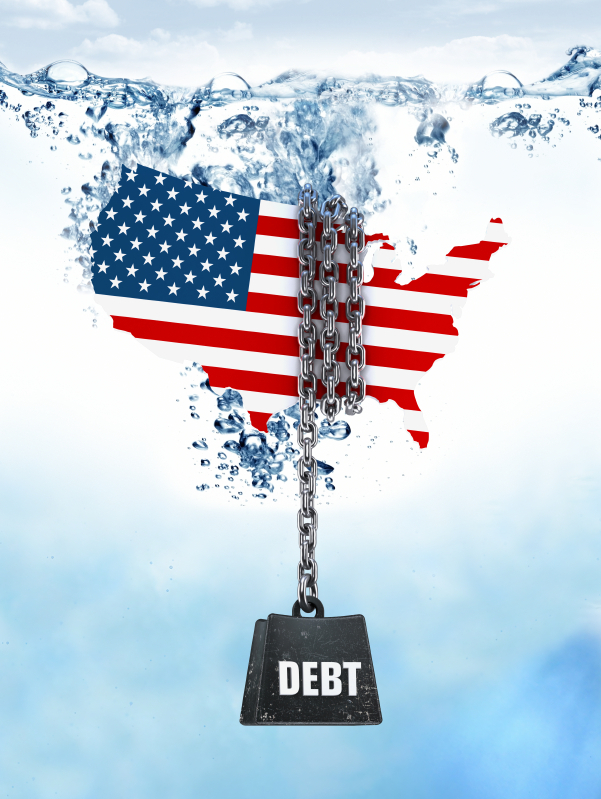 The Great Reset is Florida’s attempt to provide some concept and guidance as to how economic developers can cope with the effects of the post 2008 Financial Collapse–what we have earlier described in our issue 1, as The New Normal. Things haven’t gotten much better since Florida or the Curmudgeon wrote their earlier efforts, so perhaps it’s time to see if Florida is relevant to 2011-2012. Entitled “The Past as Prologue”, Part 1 in effect defines what he means by the Great Reset and offers a description of past resets (1873 & 1929). Florida suggests each Reset has created opportunities and innovation from which prosperity and subsequent economic growth followed. Resets then, horrible as they may be to live through, do provide the opportunity to create a new paradigm (how the Curmudgeon loves that word), a brave new world for future American cities. Because Resets are so powerful, Florida argues we should not “waste any opportunity” and focusing on his “talent class” which for him are the prime movers of innovation and technological change he will outline proposed program concepts and specific policies which, he believes will produce maximum future benefit for our urban areas. Central to his argument in Part I is the concept of “spatial fix” which he borrows from geographer, David Harvey. Each of the Resets, Florida argues, created its own distinctive “spatial fix” or a geographic, place-based configuration. Each spatial fix is shaped by and created from the opportunities unleashed by the “creative destruction” of the Reset. Also central to Part I is his belief that Urbanism is Innovation personified and that the technological revolutions which follow each reset are the prime drivers of these new spatial fixes. These innovation and technology revolutions created a new spatial arrangement and prompted internal migrations and immigration, all of which transformed the life styles and consumption patterns of Americans, and shaped the evolution and form of the cities themselves. Because Resets are so powerful, Florida argues we should not “waste any opportunity” and focusing on his “talent class” which for him are the prime movers of innovation and technological change he will outline proposed program concepts and specific policies which, he believes will produce maximum future benefit for our urban areas. Part II, “Redrawing the Economic Map” applies these broad forces discussed in Part I onto specific American cities. Again, crystal ball glazing, not being the Curmudgeon’s forte (he does not enjoy digesting crushed glass–as the saying goes), the Curmudgeon regarded this part of the book as a casual wandering descriptions of many urban areas selected by Florida for comment. These descriptions and analysis ladled out for each city were a bit too simplified for the Curmudgeon’s sensitive and discerning palate; they were more assertion than analysis. Rather these urban areas functioned more as launching pads for his thoughts regarding innovation, creativity, the talent class, free flow of ideas, density and the like. They are more blogish than bookish, and the reader will either like the comments or she won’t. There is really very little support for most of his specific city observations; they are, at root, opinions. Florida’s belief, shared by the Curmudgeon, is that there will be winners and losers created by this Reset and that the winners will be the ones who best capture innovation, creativity, and the talent class. Regarding potential loser cities, for which the Curmudgeon exhibits a special empathy, Florida presents a rather depressing list of things that can, already have or will go wrong for those unfortunate communities — but he unfailingly ends his discussion with an optimistic, can do, somehow it all can work out conclusion. He can’t have it both ways. The Curmudgeon was struck, once again, by Florida’s almost exclusive focus on a subset of city types: large cities, college towns, government boomtowns such as Toronto, Ottawa, Wash D.C. (the Curmudgeon’s current bailiwick), Austin (actually Round Rock), New York City, Charlotte N.C., big international cities in general, and Pittsburgh. In fact, Florida offers Pittsburgh, with its bottom up, community activist revitalization as a model for the chronically distressed Great Lakes communities. 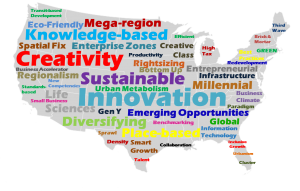 There is, however, a wide variety of city/rural/suburban areas which to the Curmudgeon’s mind just don’t fit into Florida’s image of a vibrant, fun-seeking, Gen Y, talent, open-minded knowledge-based economic development. God forbid these perfectly fine communities try to adopt his prescriptions. His third and final section, “A New Way of Life” was treated by the Curmudgeon more as a personal essay than a prescription for future action. Florida basically outlines and describes what he would like to see emerge from the opportunities which the Great Reset will create. Frankly, it is a future the Curmudgeon does not share, at least for the most part. He wants to create a new spatial fix which is based upon density, mega regions, a reset of American values and an economy based on the talent class, knowledge workers, innovation, creativity, the free flow of ideas, a geographic sorting of people by ability and educational attainment (P. 123), upgrading service jobs, renter housing with a central city bias, green and sustainable production, the “velocity of you” (eliminating congestion and speeding personal mobility) and high speed rail. The Curmudgeon initially thought he would base this review around these various ideas, but two things changed his mind: (1) The Curmudgeon could care less what Florida wants to create and (2) nobody cares what the Curmudgeon wants to create. Suffice it to say, the Great Reset left us a bit unsatisfied. The book suffers from the sad fact that much of the statistics and tables, not to mention trends and proposed future directions are a bit weathered, if not outright dated and obsolete. In only a year or so, much water has poured over the dam and it has left The Great Reset a bit damp, if not soaked. Some of the material made more sense in late 2008/early 2009 when the book was probably conceptualized and written, but events since have simply rendered serious parts of the book a bit of an “oops”. For instance, a valued initiative which Florida hopes will emerge from the Great Reset is high speed rail. Two negative developments of recent vintage (1) China has modified and curtailed its high profile and pioneering high-speed rail development, due to a crash and the Japanese earthquake, and (2) California (and the Obama administration) have committed to build one section of California’s proposed $40B (some say $100B) high speed rail project (which the Curmudgeon thinks is an incredible boondoggle in the making because of its intensely partisan-ideological foundations), signal an intermediate term discrediting of high speed rail as a solution to anything. In addition, Florida strongly argues for a positive role for government, government leadership in fact, for the post Great Reset period (which actually the Curmudgeon supports), but the Tea party Movement, a paralyzed Congress, the American and European sovereign debt crisis and the near collapse of Euro land auger poorly for a sustained government -led stimulus, perhaps for a very, very long time. These key policy prescriptions are only two examples of many which could have been cited for being a bit long in the tooth, but the coup d’grace to many of Florida’s prescriptions is not only that they are weathered but they are so rooted in Florida’s personal and professional conceptualization of economic development that they seem a bit of a deja vu of the Creative Class. So the Curmudgeon proposes that we move on and NOT focus on proposals that seem out of place, or data and tables that are way out of date, or commentary which reflects a time which has passed. Instead, we would rather comment on those aspects of the book which have garnered some comment or praise from reviewers and blogs. Three topics have been selected for our blather of the month: (1) whether Florida has misused or, at least overstated, his assertion that Resets, properly taken advantage of, can create only positive opportunities (he never describes anything bad that comes from an Economic Reset) and that over a period time they result in a new spatial fix; (2) a deeper look inside the “spatial fix” concept itself; and (3) since Florida relies on, and builds upon, concepts from his “Rise of the Creative Class” for his prescriptions for the new spatial fix to be created a discussion on how realistic and street savvy are his core concepts of “creative class”, lifestyle attraction, talent, density and creativity which flow from our third-wave knowledge-based economy. THE SPATIAL FIX: WHAT A SQUISHY CAN OF WORMS THIS IS! In preparing this issue, the Curmudgeon, of course, read a number of Great Reset blogs, commentaries, reviews and the like. Many were positively impressed by Florida’s treatment of David Harvey’s “the Spatial Fix”. The concept, as we will describe in the following paragraphs, is central to Florida’s underlying argument and there is no doubt in the Curmudgeon’s bourbon-soaked mind that Florida offers a perhaps simplistic description of past geographical spatial patterns, and presents a prescription for a future desired spatial fix which facilitates innovation, talent productivity, and the flow of ideas. Florida’s basic thesis is for economic developers to use the opportunity of the Great Reset to create a new spatial fix which is centered around density, mega regions, rental housing, and high speed rail. This new spatial fix necessarily involves geographical winners and losers. In his last section, Florida outlines (not always very clearly) his preference for using the opportunity of the Great Reset to create a new spatial fix which is centered around density, mega regions, rental housing, and high speed rail. This new spatial fix necessarily involves geographical winners and losers, but given Florida’s propensity to be optimistic he often argues that even losers can embrace policies (such as bottom up urban revitalization allegedly responsible for Pittsburgh’s renaissance) to achieve some degree of mediocrity in his brave new world. And what is this Spatial Fix? In his opening chapter, Florida introduces the concept of spatial fix. Devoting Chapter 6 to Spatial Fix, Florida states that the concept was “first advanced” by the” geographer, David Harvey”. Since we shall look in some depth at Harvey’s concept shortly, we must alert the reader that the concept “originates”, so to speak, with Karl Marx’s 1848 The Communist Manifesto (as Harvey himself is quick to insist) and that Joseph Schumpeter borrowed it in his Neo-Liberal defense of capitalism, Capitalism, Socialism and Democracy (1942) in which he links spatial fix to innovation and creative destruction. Also, the prominent Neo-Marxist, Manuel Castells, in his trilogy, The Information Age (1996) embraces the concept and applies it to explain our present global economy. Spatial fix is a big, important concept, used by many, and it has been around for quite some time. Florida argues that each of the Three Resets he considers create a new spatial and presumably destroy the old one. For instance, the Second Reset (The Great Depression) led to its spatial fix: suburbanization. He hopes the present Reset will result in “densification and mega regions” (my words). Why, however, does he use the word “fix”? And doesn’t the reader question if we should pause a bit and wonder how the Depression necessarily resulted in suburbanization and how and why the present Great Reset will necessarily create a new geography whatever it might be. Florida’s explanation is, from the Curmudgeon’s perspective, unsatisfactory (see pp. 38-40) other than correctly stating that such spatial fixes take considerable time and that they are only temporary– i.e. no spatial fix is permanent. All spatial fixes will change over time. Why this is so is not Florida’s purpose and his description of the spatial fix process is very general, largely restricted to the Great Depression, and is reduced to a “cycle” with five, ambiguously described, phases. Instead, the Curmudgeon thinks it best that we turn to him who first advanced the concept for our best understanding: David Harvey. The Curmudgeon is slightly familiar with Harvey; Harvey, like the Curmudgeon, has been around for a long while and over the years, the Curmudgeon has read several of his books. Frankly, the Curmudgeon learns much from Harvey’s concepts, insights and analysis, but seldom agrees with his solutions and his Neo-Marxian perspective. The Marxian left, however, is exceptional in its ability to diagnose problems and “internal contradictions” and also can expose relationships and patterns of behavior which capitalist pigs, like the Curmudgeon, usually turn a blind eye to. To any economic developer this translates into whatever firms and industries you see in your community today cannot be assumed to be permanent. If, for instance, the rate of increase in knowledge and innovation increases, the costs and time associated with production are likely to change and this change has spatial or geographic consequences of an unknown and unpredictable nature. Harvey has written a variety of books and articles which discuss spatial fix. The Curmudgeon has selected a short, reasonably clear (remember this is Marxist-based), very concise description of the concept, “Globalization and the Spatial Fix”, a 2001 essay published in Issue 2/2001 Geographische Revue (www.geographische-revue.d/archiv/gr2-01.pdf#page=23). For Harvey, capitalism (what the Curmudgeon would call the private sector) in its constant compulsion to reduce costs and enhance profits locates fixed assets (factories and equipment) and investment in some geographic areas, and not in others. To reduce costs and increase profits (the de facto goal of micro economics), the private sector will locate its fixed assets in those geographic areas which are lower cost, thereby permitting enhanced profits. Because of constant innovation, productivity enhancement, the costs of logistics (usually measured in distance) and communication (usually measured in time) fluctuate, and the location priorities of firms and industries can and will shift. Therefore any geographical area cannot assume its present economic status and configuration is permanent. Certainly, as Florida states, any spatial fix (such as the Great Depression’s spatial fix of suburbanization) can be significantly affected by a macro economic change such as our present Great Reset. Harvey would also add that this spatial fix can also be significantly affected by micro economic, specific firm and industry change and innovation. It’s not just capital that is mobile, so are fixed assets and firm and industry location. To any economic developer this translates into whatever firms and industries you see in your community today cannot be assumed to be permanent. If, for instance, the rate of increase in knowledge and innovation increases, the costs and time associated with production are likely to change and this change has spatial or geographic consequences of an unknown and unpredictable nature. Consider the implications of this for a cluster-based approach. Now let us turn to the word: “fix”. Harvey argues “fix” has several meanings. First, “a pole is fixed in a hole” — “it cannot be moved or modified”. A second meaning is to “fix a problem” — or solve it. This is the meaning Harvey attaches to his concept. A current spatial fix is the current choice of a geography which given the current state of costs and communication (logistics) results in fewer costs/time and thereby potential for greater profits for any firm or industry. But Harvey calls attention to a particular type of problem-solving fix when he defines his meaning of spatial fix. He defines spatial fix as the equivalent problem a drug addict faces in requiring a constant and never ending need for yet one more “fix” which only temporarily solves his present problem-need. The particular fix to which he refers is “the technological fix” which the private sector constantly requires to achieve a competitive advantage. Harvey defines spatial fix as the equivalent problem a drug addict faces in requiring a constant and never ending need for yet one more “fix” which only temporarily solves his present problem-need. The particular fix to which he refers is “the technological fix” which the private sector constantly requires to achieve a competitive advantage. Capitalism is addicted to geographical expansion much as it is addicted to technological change and endless expansion through economic growth. The problem of the private sector’s restless and constant need for technological fix and geographic restructuring harkens back to the first meaning of “fix”– which in our case means locating geographically fixed assets and investment where “it cannot be moved” without incurring costs for the firm and the geography. Harvey sees an “internal contradiction” (Marxists love these things) between the first and second meanings of “fix”. For him, the private sector is constantly in the search for innovation and technological fixes so it can continue to grow and achieve competitive advantage, but current production/investment located and nailed down in geographic areas can be, and often is, required to adjust to such changes, innovations, and technological fixes– and especially over time these changes and technological fixes can and do result in the ever constant need for geographical restructuring and re-shifting. But we are not yet done with Harvey! This “reallocation of capital creating an entirely new landscape” is both opportunity and threat to an economic developer. Yes, it certainly makes sense to be positive and assume the best from this spatial readjustment, that’s what he or she is paid to do, but the simple reality is that this is a frightfully dangerous concept. No local economic developer, and no single nation, is really in a position to meaningfully “guarantee” that any resulting spatial fix will be beneficial and the ability of either to meaningfully impact the decisions and the process of protecting existing spatial fixes and simultaneously creating opportunities to capture new spatial fixes is an awesome task indeed. There is no Journal of Spatial Fixes that can be subscribed to, and simply measuring and understanding your community’s existing industry and occupational mix or cluster is but a starting point in understanding how it is affected by largely unknowable future innovations and technology which will possibly result in a yet new spatial fix. Reading Florida we feel all warm and fuzzy and aglow with opportunity to benefit from and indeed shape and create new spatial fixes for your community. Reading Harvey, however, opens a rather squishy can of tasty and slimy worms, slithering all over the economic developer’s plate. One particular aspect of Part 1 bothered the Curmudgeon: this was Florida’s seeming belief that Resets unleashed spatial fixes which the Curmudgeon believes are actually long term, hundreds of year trends. The prime example is suburbanization. Florida holds that suburbanization is the spatial fix arising from the Second Reset, the Great Depression. The second long term trend which Florida treats as being created by the First (1873) Reset is the Industrial Revolution itself. If the Curmudgeon is correct in his observation, Florida mistakes these long term trends as being initiated by an economic Reset. While this is no time to leap into a discussion of suburbanization, for instance, the Curmudgeon believes the weight of evidence supports a reality that urban areas have been prone to “sprawal”, or expansion at their periphery since ancient times. Indeed, historical works for American suburbanization, including Kenneth Jackson’s CRABGRASS FRONTIER (1987) and Sam Bass Warner’s, STREETCAR SUBURBS (1978), suggest rather strongly that the impulse, and practice of, suburbanization predated any Reset and appears as much to be an expression of the American Dream as any contrived decision by capitalists, developers, and government highway bureaucrats. Longstanding, almost pre-capitalist cultural trends, are not spatial fixes. Maybe the Curmudgeon is wrong in thinking that Florida allows Harvey’s concept of spatial fix to degenerate into a somewhat amorphous, but semi-formal process or even an actual conscious decision by capitalism and capitalists (let’s call it the private sector). This tendency to view a spatial fix as a logical, almost conspiracy of profit and distortion, obliterates much of the value in the Harvey’s definition of the concept. Florida seems to take this notion of spatial fix yet one step further. He seems to argue in later sections of his work that the Great Reset being an opportunity to create, perhaps by coordinated public policy, a brand new spatial fix based around density, big central cities, talent, creativity and the like is an open invitation to believe he conceives spatial fix as a matter of conscious policy determination by some set of powerful elites. It seems almost like getting together in a room and deciding which type of spatial fix will occur. Spatial fixes are the geographical expressions, sometimes of long term trends, and are not consciously decided upon by anyone or any set of actors. They result from forces which create profit and which prosper best in certain locations as opposed to others. Such spatial fixes can be reinforced once recognized by both public policy and by specific decisions of the private sector- but the underlying fundamentals (profit, market and transportation technologies, cost) govern the evolution of the spatial fix which at root remains less a decision than a geographic manifestation. The Great Reset’s mentality and perspective is firmly locked into the fabric of “The Rise of the Creative Class” at least in the sense one sees a rather chronic continuity in the arguments and concepts advanced in the Rise, and Florida’s analysis and prescriptions for our Great Reset. As cited in a 2002 Washington Monthly article (amazingly entitled, “The Rise of the Creative Class”) “The distinguishing characteristic of the creative class is that its members engage in work whose function is to ‘create meaningful new forms’”. Can we call “new forms” innovation? If so, the Curmudgeon is comfortable in asserting that Florida is a member of the so-called “knowledge-based, innovation economy” school of thought discussed in an earlier issue. 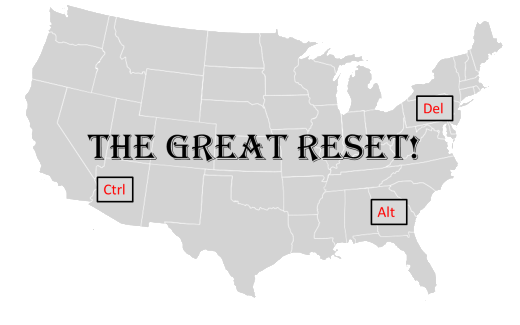 Much of the Great Reset’s describes how the Reset can create opportunities for system-altering innovations/new technology and new forms of knowledge. Accordingly, the Great Reset is permeated with examples of how specifc idea and innovations Florida particularly values can (and should) be liberated by the current Great Reset. Past innovators such as Edison receive special emphasis, are considered as heroes of past Resets to be emulated in the current one. Technologies, such as High Speed Rail, he hopes will benefit from the current reset and will lead the creation of a new economy. As such, Florida’s last section and his last observations paint an optimistic picture of what will finally emerge from our New Normal, his Great Reset. A brave new world potentially awaits us–if we learn from past resets and seize upon the opportunities to innovate and create a really new departure from the economy and technologies of the present day.